Everyone finds it difficult to cope at times, especially when faced with unavoidable external stressors. Sometimes, however, stress is self-generated – that is, we bring it on ourselves, whether by worrying about events that will probably never happen, generating conflict with friends and family because of unrealistic demands or unhelpful thinking patterns, taking too much on because we find it difficult to say no to people, or countless other examples. Self-generated stress is a big problem. Research confirms stressful life events can lead to depression in vulnerable people. 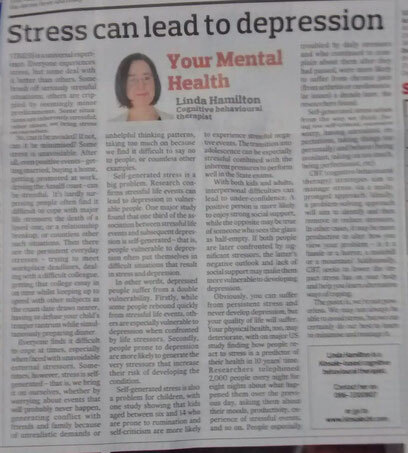 One major study found that one third of the association between stressful life events and subsequent depression is self-generated – that is, people vulnerable todepression often put themselves in difficult situations that result in stress and depression. In other words, depressed people suffer from a double vulnerability. Firstly, while some people rebound quickly from stressful life events, others are especially vulnerable to depression when confronted by life stressors. Secondly, people prone to depression are more likely to generate the very stressors that increase their risk of developing the condition. Self-generated stress is also a problem for children, with one study showing that kids aged between six and 14 who are prone to rumination andself-criticism are more likely to experience stressful negative events. The transition into adolescence can be especially stressful combined with the inherent pressures to perform well in the State Exams. With both kids and adults, interpersonal difficulties can lead to under-confidence. A positive person is more likely to enjoy strong social support, while the opposite may be true of someone who sees the glass as half-empty. If both people are later confronted by significant stressors, the latter’s negative outlook and lack of social support may make them more vulnerable to developing depression. Obviously, you can suffer from persistent stress and never develop depression, but your quality of life will suffer. Your physical health, too, may deteriorate. One major US study finding how people react to stress is a predictor of their health in 10 years’ time. Researchers telephoned 2,000 people every night for eight nights about what happened them over the previous day, asking them about their moods, productivity, experience ofstressful events, and so on. People especially troubled by daily stressors and who continued to complain about them after they had passed, were more likely to suffer from chronic pain (from arthritis or cardiovascular issues) a decade later, the researchers found. Self-generated stress arises from the way we think (being too self-critical, excessive worry, having unrealistic expectations, taking things too personally) and behave (being avoidant, taking on too much, being perfectionist, etc). CBT (cognitive behavioural therapy) strategies aim to manage stress via a multi-pronged approach. Ideally, a problem-solving approach will aim to identify and then remove or reduce stressors. In other cases, it may be more productive to alter how you view your problem – is it a hassle or a horror, a molehill or a mountain? Additionally, CBT seeks to lower the impact stress has on your body and help you learn alternative ways of coping. The point is, we’re not powerless. We may not always be able to avoid stress, but we can certainly do our best to learn to minimise and manage it.